If so, replacing it with one of the high energy efficient units that carry the ENERGY STAR label can save up to 20 percent on your heating and cooling bill. Are your power bills more expensive than last year? As your HVAC system ages, it can become less efficient and run harder and longer, increasing energy costs. Is your AC not cooling certain areas of the house? Outdated equipment, improper placement of air ducts and inadequate insulation can cause AC units and heating systems to cause inconsistent temperatures throughout the home. Is energy being wasted while you are away? You may want to consider a programmable thermostat, which will help conserve energy. Eco Pro Air Conditioning can assess your current system and make recommendations on new A/C units for your home. Whether you are considering a split system, a mini split system or central package units. 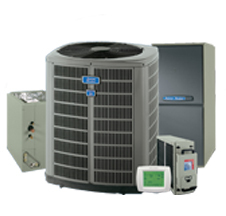 Our experienced sales professionals at Eco Pro Air Conditioning are committed to finding the best AC solution for your home and are ready to assist you in choosing an customized system that works for your home’s unique layout. We offer a large variety of air conditioners from leading manufacturers, with makes and models to fit your budget. The prices/cost of installing a new AC system or heat pump will pay itself off when you see your energy bills reduced. With AC financing available, your upfront expenses may be more affordable than you think. Call today for a free quote and talk to one of our professional air conditioning service technicians who can help you make the right choice for your new air conditioning system.